You may encounter three types of birch trees in the United States that feature white bark. These white birches include the paper birch (Betula papyrifera), the gray birch (Betula populifolia) and the European white birch (Betula pendula), an ornamental species introduced from overseas. Identifying these white birch trees depends on your capability to recognize differences in their features. All three possess an attractive white bark on the older trees, so distinguishing one from the other will require a more discerning eye. Estimate the sizes of the white birch trees you discover. The tallest of these three types in the wild is the paper birch, a tree that can exceed 70 feet in some instances. The European variety can grow to 50 feet tall, according to the Floridata website, while the shortest is the gray birch, a tree typically between 20 and 40 feet high. Examine the leaves of these birches closely. Measure them for length and you will find that European birch leaves are a bit shorter than the other two at a maximum length of 2 1/2 inches. The paper birch has leaves that can grow to 4 inches in length, and the gray birch leaves average between 2 and 3 1/2 inches long, states the University of Connecticut Plant Database website. Study the disparity between the shapes of the leaves of the white birch species in America. Paper birch has a leaf shaped like the point on a spear, with a more rounded base. The gray birch has a longer and narrower point on its tip, which makes it almost seem triangular. The bases of European white birch leaves are blunt and the tips long and pointed. Observe the trunks and the branches of the white birches and try to detect differences in them. Gray birch trees often have a bushy appearance, with multiple stems emanating from one trunk, branching off quickly above the ground into various sections. Paper birch trees have branches just a few feet above the ground, when you find one growing in the wild, and normally just a single main trunk. European white birch trees have a slender trunk of perhaps a foot in width and noticeably drooping branches throughout its canopy. Inspect the bark of all the white birches. 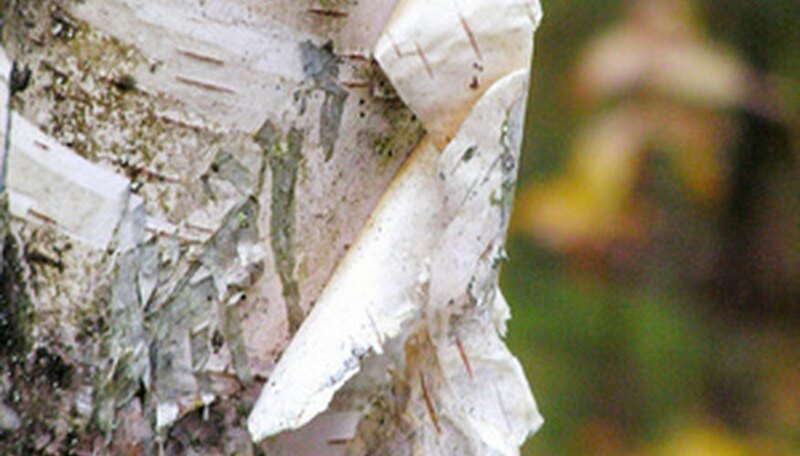 Paper birch bark peels off the tree in long, narrow strips and exposes an inner bark that is orange in color. Gray birch bark does not come off the tree without much difficulty. "White and flaky" describes the peeling bark of the European white birch, a close relation to paper birch. However, try not to peel the bark off living white birches; this could ultimately harm the health of the tree.